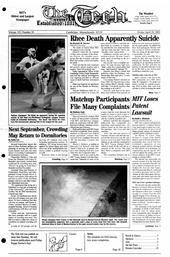 The Tech published a follow-up article, Harvard/MIT Matchup Service Will Keep Contacts Anonymous, on Feb. 3, 2004. Harvard University students filed a series of harassment complaints with MIT and Harvard campus police in connection with the MIT-Harvard-Wellesley Matchup service offered this past February. Both universities and MIT Stopit received complaints from female students at Harvard Law School about persistent e-mails they received from Jonathan Monsarrat ’89, the matchup’s creator and operator. DeSario said that she originally addressed her complaint to matchup-request@mit.edu, the address listed on the Web site for the matchup, http://www.mit.edu/ matchup. After she did not receive a response, DeSario said that she suspected that Monsarrat was the only person receiving mail from that address, so she sent her complaint to the MIT Young Alumni Club, which is listed on the web site as a sponsor of the service. The club then filed a complaint with MIT Stopit. The complaint also mentioned Monsarrat’s communication with another participant. “He started sending her charts of his weight loss, promising that he would lose more weight in the future ... and begging her to meet up with him,” DeSario said. Monsarrat referred to the second attempt at contacting each match as a “follow up e-mail” and said that he used two form e-mails when contacting a potential match. De Sario said that she met with Harvard University police last Friday and that a “cease and desist” letter will be sent to Monsarrat informing him of police involvement in the matter and saying that further e-mails to Harvard students will result in criminal prosecution. Monsarrat said that he has not been contacted by either the MIT or Harvard University police. DeSario estimates the number of people repeatedly contacted by Monsarrat as “potentially hundreds of people,” though she says she personally knows of only 10 who have come forward. “Just about everybody I’ve talked to at Harvard Law School has been contacted by this guy,” DeSario said. Monsarrat said that he received 100 matches through the matchup, and contacted all of them. Each participant in the matchup was given 20 possible matches and people who referred a friend got more than 20. Monsarrat said that he referred a friend, and called the fact that he received 100 matches “not at all unusual,” though he was “the only volunteer” who received that many matches. Participants in the matchup were paired using computer software that Monsarrat said he designed after what he considered to be a good match to him. He then generalized the properties of a good match and used the software to give participants their matches. Some members of the Student Information Processing Board, which was responsible for granting Monsarrat the Web address used for the matchup’s Web site, recognized the questionable uses that the matchup could have. The matchup Web address points to Monsarrat’s home directory on Athena. Monsarrat said he hopes to run the matchup again in June, this time offering participants unlimited matches. The new version of the matchup, Monsarrat said, will allow participants to search the database. SIPB Chair Chris T. Laas G said in an e-mail that “at this time, the SIPB has received no official complaint. We will rely on the judgement of the MIT authorities” in the matter of a June matchup.